Henry arrived from El Salvador in 2010, Graduated from Doherty Memorial High School in 2012. He earned an Associates Degree in Computer Science from Quinsigamond Community College in 2017. His favorite hobby is traveling and spending time with his family. 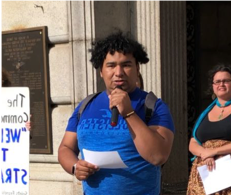 Additionally, he was a Raise Up Massachusetts organizer fellow during the summer of 2018. While there, he helped organize and gather signatures for the $15 Minimum wage and the Paid family and Medical Leave campaigns in the Worcester area. Henry also organizes immigrants under protection of TPS and advocates for Permanent Residency.